Fashion-Forward: American Eagle Previews Summer Looks! Want to find out what’s hot this summer before everyone else? 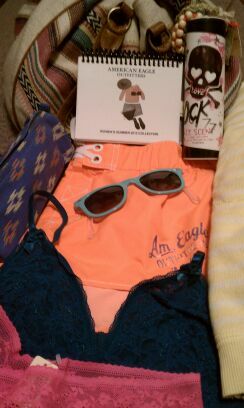 Just yesterday American Eagle hosted their annual Summer 2012 preview and it’s clear that this summer is all about fun in the sun! Light weight layers, summer scarves, bright (sometimes even neon!) colors, and lacy tanks are so in – and AE’s concert bra is a must-have. Inspired by concert-going gals (think Coachella) who get a little too hot in the summer sun, this cute bra allows you to whip your shirt off while still staying classy and cute. Rompers and dresses get wild in tribal and floral patterns, and paired with a boho-chic bag and flat sandals – get ready to be called out as a fashionista! American Eagle’s summer-wear hits stores in April. Ladies, get your credit cards ready and start saving up now for these hip buys!